We are recruiting for a full time, experienced, vibrant, well-organised, proactive, solution-driven and attention to detail individual, who is passionate about developing people, to occupy the Assistant Project Manager – Youth Skills Development programme position within a fast paced and dynamic working environment. 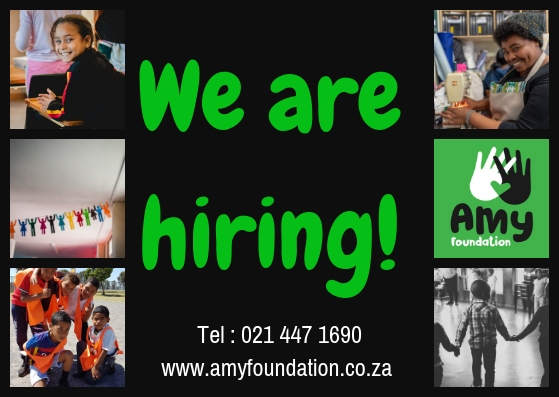 The Amy Foundation is an NGO and runs a skills development programme for school-leavers and unemployed Youth. The Successful candidate will report directly to the Project Manager and will work closely with the programme coordinators, facilitators & learners, as well as Development partners. Helping to drive and grow a successful outcomes-based youth skills development programme. Must be a self-starter, with excellent work-ethic, innovative & creative, reliable, energetic, enthusiastic, dedicated, committed & flexible, with an ability to manage people and your time. Some flexibility around office hours could be considered for the right individual. Could suit an individual looking for a ‘2nd career’ post-Corporate. Only shortlisted candidates will be contacted for interviews. If you have not been contacted 2 weeks after closing date, consider your application as unsuccessful. Updated and detailed CV with all previous employers, achievements and qualifications. Full details of 2 contactable references. Certified copy of ID and matric certificate. Closing date for all applications is 19th of April 2019, 17:00 Late applications will not be accepted.